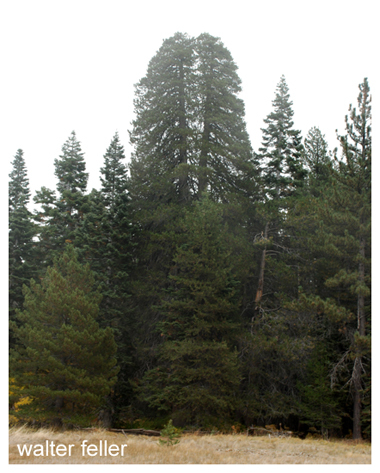 Structure-- Lodgepole pine typically forms open stands of similarly sized specimens in association with few other species and with a sparse understory (Rundel et al. 1977). On fertile sites, trees can reach a height of 40 m (130 ft), but typically a stand consists of groups averaging 15 to 20 m (40 to 65 ft) in height. Nine stands in Sequoia National Park (Van Kat and Major 1978, cited in Rundel et al. 1977) averaged 56 percent crown cover, 3390 trees per ha (1370 per ac), and 58 sq m (625 sq ft) of basal area per ha (2.5 ac). Mature Sierran stands often contain significant seedlings and saplings, in contrast to the even aged character of stands in the northern Cascades and Rocky Mountains (Critchfield 1980). Composition-- Lodgepole pine overwhelmingly dominates the habitat. Occasional associates include aspen and mountain hemlock. The amount of understory is weakly correlated with overstory density (Bartolome 1983). The understory may be virtually absent, consisting of scattered shrubs and herbs, or a rich herbaceous layer at meadow margins. Many lodgepole stands are associated with meadow edges and streams, where the understory consists of grasses, forbs, and sedges. In the southern Sierra and mountains of southern California, understory shrubs such as huckleberry and mountain heather may be common (Cheatham and Haller 1975). Other Classifications-- Lodgepole Pine habitats form an easily distinguishable subdivision of the mixed conifer forest. Other classifications are Lodgepole Pine (U.S. Forest Service 1981) and Lodgepole Forest (Munz and Keck 1949). Classifications based on potential vegetation may not include a lodgepole pine type, considering it successional to other forest types. Vegetation Changes-- 1;2-5:S-D. Three major disturbances affect lodgepole pine in California: fire, insects, and logging. These disturbances create openings of various sizes that lodgepole pines rapidly recolonize (Lotan and Perry 1983). The stages of vegetation change are primarily the result of increased tree density, canopy cover, and size. A short period of herbaceous productivity precedes closure of the tree canopy on productive sites. The prolific seed output, establishment, and seedling growth of lodgepole pine makes the period of herbaceous production short. Continued recruitment into stands produces overstocking and slow growth of the overcrowded trees. This overcrowding may make them susceptible to insects (Lotan and Perry 1983), although others have argued that the more vigorously growing trees are more likely to be attacked. Beetle infestation creates large quantities of fuel that increase the probability of wildfire. Many Sierran meadows have been invaded over the last few centuries by lodgepole pine (Benedict 1982); creating new dense stands. Although the understory persists, productivity is lowered (Bartolome 1983). The causes of this invasion remain poorly understood. Repeated episodes of tree invasion and subsequent reestablishment of meadows have occurred since the most recent glaciation. Duration of Stages-- Young pines establish very rapidly and become reproductive; five year-old lodgepole pines are capable of producing cones (Critchfield 1980). Within 20 years, the canopy closes and understory productivity becomes negligible (Basile 1975 (Not in Hab Lit Cite)). Duration of the type thus depends on subsequent longevity of the trees. Stand persistence appears inversely related to site productivity (Lotan and Perry 1983); highly productive sites in Washington and Idaho were reported to start losing trees at 80 to 100 years. The upper limit of tree age seems about 400 years, although Critchfield (cited in Rundel et al. 1977) estimated one tree in the Sierra to be at least 600 years old. Habitat-- Typically the lodgepole pine zone is found above red fir and below the other subalpine conifer habitats (Rundel et al. 1977). Although the boundaries between lodgepole pine and meadow are dynamic, they are easily differentiated in classification of the existing landscape. Lodgepole pine most closely associates with the red fir habitat of lower elevations. Although lodgepole pine is widespread, it is generally a minor forest element in other habitats. At the upper elevation limits of lodgepole pine in southern California, the trees may adjoin alpine habitats. Wildlife Considerations-- Lodgepole pine stands have low structural diversity and are relatively low in animal species. Many species found in lodgepole pine stands are associated with the meadow edge. The Lodgepole habitat provides suitable habitat for 6 reptiles and amphibians, 49 birds, 35 mammals (Verner and Boss 1980). These species include wolverine (rare), goshawk (sensitive), bald eagle (endangered), and prairie falcon (sensitive). Lodgepole pine occupies an array of landscape units within its zone of adaptation. Areas of lodgepole pine in the red fir habitats are characterized by poor drainage and often a cooler microsite. Lodgepole pine is commonly associated with meadows (Rundel et al. 1977). Although lodgepole pine has well developed water regulation mechanisms, it typically occupies areas with at least seasonally wet soils. Annual precipitation in the lodgepole pine zone averages from 750 to 1000 mm (30 to 40 in) annually, mostly as snow. The growing season is short, averaging 2 to 3 months (Rundel et al. 1977). Lodgepole Pine habitats are scattered throughout the state, but concentrated in the Sierra Nevada and southern Cascades. Significant stands, however, occur in the higher mountains of southern California (Griffin and Critchfield 1972). Well developed lodgepole pine habitats are found above 1800 m (5900 ft) elevation in the northern Sierra and above 2400 (7900 ft) in the south. Bartolome, J. W. 1983. Overstory-understory relationships: lodgepole pine forest. Pages 1-4 In E. T. Bartlett and D. R. Betters, eds. Overstory-understory relationships in western forests. West. Reg. Res. Publ. No. 1., Colorado State Univ., Ft. Collins. Benedict, N. B. 1982. Mountain meadows: stability and change. Madro�o 29:148-153. Critchfield, W. B. 1980. Genetics of lodgepole pine. U.S. Dep. Agric., For. Serv., Res. Pap. WC-37. Griffin, J. R., and W. B. Critchfield. 1972. The distribution of forest trees in California. U.S. Dep. Agric., For. Serv. (Berkeley, Calif), Res. Pap. PSW-82. Lotan, J. E., and D. A. Perry. 1983. Ecology and regeneration of lodgepole pine. U.S. Dep. Agric., For. Serv., Handbook. 606. Rundel, P. W., D. T. Gordon, and D. J. Parsons. 1977. Montane and subalpine vegetation of the Sierra Nevada and Cascade Ranges. Pages 559-599 In M. G. Barbour and J. Major, eds. Terrestrial vegetation of California. John Wiley and Sons, New York. Big Bear California tour to the largest lodgepole pine in the world.